Army CID for over twenty-two years, with fifteen of those at Fort Campbell, KY, where he identified the growing gang problem in the early 1990s and later started the Army’s first Gang & Extremist investigations team. He investigates and researches topics like spontaneous gang formation, military-trained gang members, gangs and their use of technology, and gang members in colleges and universities. He has been interviewed about gangs by several news sources, and has appeared twice in the History Channel’s Gangland series. He was a founding (and still serving) board member of the Tennessee Gang Investigators Association, and is a three-time recipient of the Frederic Milton Thrasher Award of the National Gang Crime Research Center. His recent book “Gangs and the Military” documents twenty-five years of investigation and research into street gang, outlaw motorcycle gang, and domestic-terrorist extremist group members with military training. Gang experts have described the book as a "must read for anyone concerned with the gang problem in America," with "clearly articulated evidence of the infiltration of the gangster mentality within our nation's military branches," that is "well researched, very comprehensive and well proven." I read Gangs and the Military: Gangsters, Bikers, and Terrorists with Military Training by Carter F. Smith in order to learn more about this phenomenon as research for a work of fiction I have planned. I wanted to learn about the gangs associated with spreading the crack network throughout the U.S.A. during the eighties. This book taught me all about those gangs and so much more. I was under the impression that the gang and military connection was something new in America, but to my surprise these two things have had a connection almost from the beginning. The fact that Carter F. Smith does a thorough job outlining and explaining the history of the connection is one of the book’s most appealing points. There are a lot of colorful characters on display here and their history and the effect on American communities is told in an illuminating and compelling voice. Make no mistake, the connection between gangs and drugs is something every citizen should be concerned about. Carter F. Smith makes this clear and, as a veteran, I felt it even before I read Gangs and the Military. Gangsters, bikers, and those with terrorist leanings need to be denied military training as much as it is possible to do this in a free society. The criminal characters in this book make that clear. 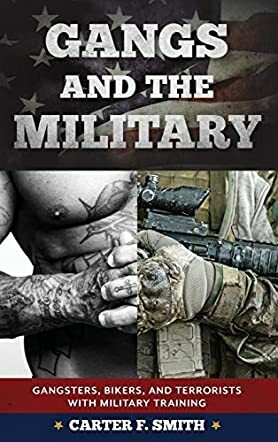 Gangs and the Military: Gangsters, Bikers, and Terrorists with Military Training was written for all of us, but it is especially pertinent to those in law enforcement and those serving in the military. Rich in detail and facts, this book is of great service to society.